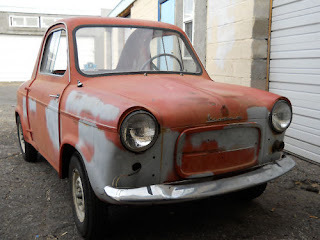 Riley Kestrel 1300 - If you've been reading this blog for awhile, you know that I'm a fan of the old BMC / British Leyland ADO 16 cars (ADO 16 stands for Austin Drawing Office project #16) . I even bought one at one point in my life. 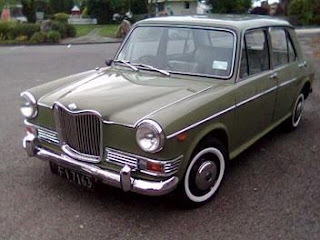 The Riley 1300 Kestrel is more "upmarket" than the Austin and MG ADO 16s we got here in the US. The interior is leather and the wood dash features nice round gauges, including a tach. This is a very nice Riley Kestrel. It's from New Zealand and right-hand-drive. Located in Charleston, SC, click here to see the eBay listing. 1959 Vespa 400 - I've never been a huge fan of microcars, but they have a significant place in automobile history, especially in Europe. The seller describes this one as being "in a very gray area between project and runner". He goes on to say, "I rescued this car out from under a tarp and brought it back from the dead, only now it's still sort of a zombie". Located in Albuquerque, New Mexico, click here to see the eBay listing. A Bunch of Cars In San Jose - This guy has 4 or 5 interesting cars for sale. His Craigslist ads are fairly confusing. Click here to find the ad for the Rover SD1 3500. Click here to see the ad for a Mercedes Benz 560 and 380SL. Click here to see his Triumph Stag ad. Click here to see his Mercedes Benz 380 SEC ad. He may also be selling a Jaguar XJS Cabriolet (a car on my Top 10 most wanted list). I couldn't find the ad, however. The seller leaves a phone number to call for more info. Oh man, those "Bunch of cars in San Jose" already had their listings expired. That's no fun. But, the collection of cars that he has/had were pretty neat, at least. Anyone know what the SD-1 was listed at? It is really high on my bucket-list.